Surrey Schools is the winner of the 2015 Sylvia Charp Award for District Innovation because it stopped just handing out technology to its 125 schools and instead asked its educators to share their ed tech ideas — and to put them to work in the classroom. Rolling out an educational technology initiative to 125 schools and 70,000 students may sound like a monumental undertaking, but it's one that Surrey Schools in British Columbia, Canada, took on willingly. The ambitious goal was to bringing the district's classrooms, facilities, IT infrastructure, teachers and students into the 21st century. To get there, the district would have to buy hardware and software, train its teachers, revamp its infrastructure and take myriad other steps. Through careful planning and budgeting, involving key individuals and the realization that both schools and administrators thrive when they have the flexibility to make their own decisions, this large district has exceeded its original goals and is now moving on to new projects. 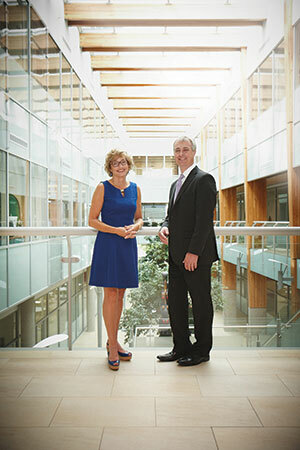 Surrey School District's Elisa Carlson, director of instruction, and Dan Turner, director of information management services. About five years ago, Surrey Schools decided that its days of simply distributing new hardware to its 125 K-12 institutions and hoping it all went to good use were over. Instead, said Director of Instruction Elisa Carlson, "We started asking schools to develop their own site-specific hardware and learning plans. We wanted to know how they were going to use the technology to transform learning." Concurrently, the district began encouraging teachers to form groups and use a "collaborative inquiry process" to explore key teaching and learning topics. Those groups would then develop the learning plans that the schools submitted to the district. "We got all of the teachers around the table together," said Carlson. "That allowed us to embed the professional development right [down] to the school level and tie it to the technology." The outcome of those exercises was an innovative learning design strategy that Surry Schools started using in 2010. According to Carlson, the grassroots model enabled transformation from the ground up, based on commonly determined guiding principles. These principles invited innovation grounded in professional, teacher-to-teacher inquiry that could happen in workshops, through blogging or on social media. That last piece was "really significant," said Carlson, whose team gave instructors the opportunity and freedom to experiment and play with the new technology — rather than just throwing it at them and expecting positive results. "We encouraged teachers to blog about their use of technology and share their insights via social media like Twitter," said Carlson. "That really helped to propel change across the district; it was a key to successful fusion strategy." 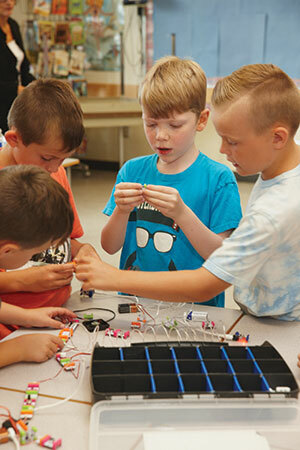 Students in the makerspace at White Rock Elementary School work and play with Littlebits and MakeyMakeys. To formally "brand" its new, shared vision for education, Surrey Schools named the effort "Learning by Design" or LbD. Describing it as an innovative philosophy that distinguishes the district, aligns and empowers stakeholders and supports planning and classroom design, the district divided the initiative into three distinct categories: learning, structures and tools. Focused on embracing technologies, innovation and connecting learning to the community, LbD is spearheaded by a District Technology Advisory Committee (DTAC) that includes Carlson, CIO Dan Turner, Superintendent of Schools Jordan Tinney, Deputy Superintendent Rick Ryan and Assistant Secretary Treasurer Patti Dundas. And while Carlson and Turner are accountable for LbD policy, planning and implementation work, the process is highly collaborative in nature and focused on building capacity within the district's 125 schools. Tinney said, "Our goal was to use the technology to really transform the nature of the learning experience for the student. That guiding mission has been central to our work. As part of that goal," he added, "we've really tried to encourage teachers to use technology not for consumption but for creation." Carlson concurred, and said the district went beyond simply using digitized flash cards or e-readers in the classroom by encouraging teachers to create entirely new forms of learning and understanding. "We want teachers to engage in their own knowledge creation," she explained, "and to collaborate with others using multimedia, social media and other 21st century tools." As part of the rollout, Surrey Schools introduced digital portfolios to teachers who had previously handled the assembly, review and display of student work in a manual, fragmented manner. "Through our digital portfolios, we're taking an innovative approach to documenting evidence of student learning using technology," Tinney said. For example, instead of reporting on students' progress three times a year via the traditional report card, teachers focus on progressive assessment practices. Using tools like the FreshGrade app, for example, they can capture and share information with students and parents daily. "This forms the basis for a dialogue to extend learning that wasn't possible before," said Carlson, who credits FreshGrade (which has a local presence in Kelowna, B.C.) with introducing the concept of digital portfolios to Surrey Schools. "At the time, FreshGrade was a small firm that worked collaboratively with us; we like to think of it as our research and development department," Carlson explained. "The company had an idea to provide teachers with a tool that would help them communicate with parents, and it all kind of grew from there." Using the free app, students can upload photos and videos of their work, conduct self-assessments, ponder what could be done better next time and share their progress with their parents and teachers. The district recently won the Cmolik Prize for Enhancement of Public Education in British Columbia for its digital portfolio efforts, which have been well received by teachers across all schools. "I have teachers and parents begging me not to make them go back to our old way of reporting grades and progress," said Tinney, laughing. "We've put a lot of power in our teachers' and learners' hands by simply partnering up with a local company and expanding our technology stable with this app." And while the notion of teachers begging not to have to go back to the "old days" of doing things may make Tinney chuckle, he said he sees this level of buy-in as critical to the district's overall success on the technological front. "You've got to get to a place where teachers feel that their practice is better because of the tech tools," he pointed out. "Unless that happens, the initiative will never be sustainable." It's no secret that K-12 teachers enjoy a dose of autonomy. Given free rein to be creative, many of them stretch their wings and start teaching in more innovative and effective ways. Knowing this, Surrey Schools embedded the "permission to try something different" into its transformation strategy. At the Surrey Academy of Innovative Learning (SAIL), the district’s blended learning program, a student explores the possibilities of 3D printing. This liberty created an environment where, instead of being tied to a specific list of learning outcomes and things to accomplish, teachers could engage their students more deeply in the learning task. "We didn't want them to cover 120+ different learning objectives briefly; we encouraged them to focus on specific objectives more intensively and for a longer period of time," Carlson explained. "They can work on topics that students are really passionate about, versus having to follow a prescriptive list as required by the curriculum." Before the LbD initiative, one of the obstacles to teachers' creativity was technology that was either unused or misused. So during the transition, Turner and his IT team focused on what he called the "technology envelope" that would support the kind of truly individualized instruction that the district was aiming for. As part of that endeavor, Turner looked carefully at the barriers that were holding teachers and students back from using technology effectively in the classroom. "We had a very close view of every school, classroom, server, laptop, iPad or other piece of technology that was in use," Turner said. "We used that visibility to ask the question: What on the technology side is preventing people from accomplishing their goals?" As the district uncovered the answers to this question, the IT team worked to systematically remove the barriers and make the educational technology process easier on users. For example, if a firewall setting was preventing teachers from downloading necessary files or visiting specific Web sites relevant to their curriculum, a newer, more flexible policy was established. Today, Surrey Schools' wireless network is accessible across all campuses and with no password required. Students and staff are both encouraged to bring their own devices from home to use in class. "We try to have a guiding principle of openness," said Turner. "We look at how we can make things happen instead of how we can prevent things from happening." Looking back over the last five years, one of the biggest issues that most districts run into during such initiatives — namely, funding — hasn't been a major issue for Surrey Schools. "We have two sources of technology/hardware funding for schools," Carlson said. "Principals are provided with funding that they use to run their schools, and the district distributes hardware, a process that's now tied into every school's specific learning plan. As a result, we haven't run into any major funding challenges." Classes at White Rock Elementary School connect with authors around the world by Skyping with their laptops and iPads. Since introducing LbD in 2010, Surrey Schools has seen a number of benefits. For starters, its teachers are not only better equipped to manage and instruct in the 21st century classroom, but students have gotten pretty excited about the new tech tools that have been put in front of them. "By building teacher capacity, and by helping them see how positively technology can change their practice, our instructors have become excited and inspired," said Carlson. "That level of enthusiasm transfers right into their classrooms. It's contagious." On the technology infrastructure front, Turner said that the fact that 60,000+ wireless devices connect to Surrey Schools' wireless network on any given school day is proof that both teachers and students are embracing technology in new ways. "There's been a dramatic increase in the number of connected devices and the amount of bandwidth that's being utilized," said Turner. "In my opinion, that's an indicator that people are finding value, purpose and reasons for using the technology. We weren't seeing that just a few years ago." Supporting all of that technology has become more complicated for the district IT team, whose role has shifted somewhat as LbD has progressed and expanded. "The job inside the IT department isn't getting any easier, namely because there are now so many different devices to support and more software to respond to," Turner said. "Keeping everything up and running, and responding quickly on support calls from students and teachers, is definitely a full-time job." Surrey Schools isn't resting on its laurels when it comes to technology. In fact, Carlson, Tinney and Turner all said they see LbD as a "work in progress" that will be honed over the coming years as technology and learning needs change and morph. "We have a lot of teachers doing great things in their classrooms right now," said Tinney. "Our next move is to make sure we have a place where other instructors can go to see that great learning in action." To this end, the district's next goal is creating "learning labs" where teachers and students can see firsthand how technology such as digital portfolios and makerspaces is being used the classroom. To K-12 districts or schools that may be struggling with how to effectively fuse education and technology, Carlson said a good starting point is always the classroom teachers who spend their days face-to-face with students. Team these individuals up with one another and let their creative juices flow, she said, and you may be surprised with what they produce. "This can't be a top-down directive or a mandatory rollout. It's about getting teachers to experiment, play and learn with the new tools that are at their avail," said Carlson. "There's no cookie-cutter approach to innovation. To work well, it really has to have the fingerprint of the schools and teachers on it."